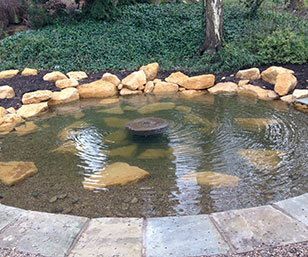 Remember your loved ones in our new Memory Garden, a peaceful landscaped area within the Botanical Gardens. Located alongside the cascade and pool, the memory garden is centred around a newly constructed pool with a millstone water feature. The flowing water, circular ripples and landscaping is designed to be spiritually appropriate for memories and celebrating life. The creation of the memory garden is thanks to funds raised by the Friends of the Botanical Gardens. The first phase was completed in January 2015 and planting will commence in the Spring. The memory garden creates the opportunity for a commemorative plaque to be placed within the stone slabs surrounding the pool, to celebrate the lives of loved ones. It could be an alternative to a gravestone or memorial within the grounds of a crematorium or cemetery. The cost of sponsorships starts at £1,000. The sponsorship funds will not only go towards maintaining the memory garden, but also to sustaining the gardens for future generations. There are a couple of other options: ashes can be scattered within the gardens and/or the person’s details can be added to the sponsors directory on the gardens’ website. Families can decide what information the database makes public or private, which is only accessible to family members and friends that know the password. The sponsorship will also include three years’ membership to the gardens, so family and friends can visit as much as they like.